The fourth day of the conference - 1 December 2016 - saw a bit of a change to the schedule as the plan was to get over to the Patriarchal Cathedral of the Holy Resurrection in Kyiv on the left bank of the Dnipro River. Breakfast was served earlier than usual, but then day really started with the Lectio Divina. The excerpt from Sacred Scripture that was chosen for this day (Luke 12:2-12) focused on our need to remember that the Lord is truly overseeing all things and, if we permit Him to, He will provide for all things. The first intense session dealt will many matters, but perhaps the focus was on the digital and printed resource materials that are now provided for the realization of the Vibrant Parish strategy. Various sub—committees and associated offices of the Ukrainian Catholic Church (UGCC) shared with the plenary session about what they have available, what they have to offer and they wanted to learn from the Coordinators about what resources would be helpful. Sr. Luisa (Ciupa, SSMI) spoke at length about developments with the Catechism programs for the UGCC as they slowly adapt to the new Catechism “Christ-Our Pascha”. Fr. Peter Rak and Sr. Davida, SSMI, spoke about the planned activities of all the Commissions of the Patriarchal Curia of the IGCC for the next three years – especially, again, as this activity is associated with the goals and activity of the Vibrant Parish movement. Fr. 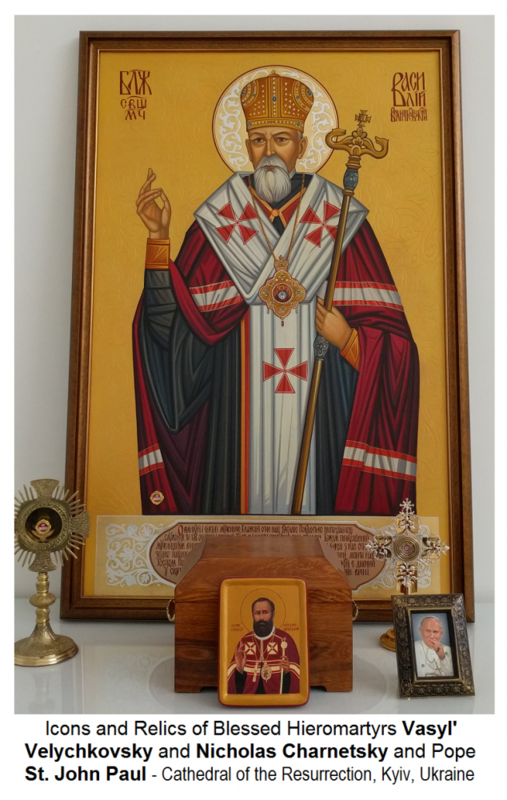 Volodymyr Zinko presented the publications of the Church and the web-resources now available. 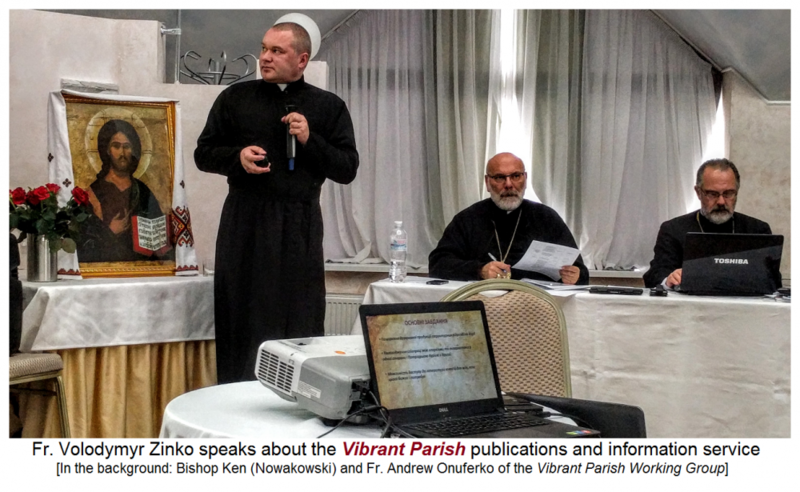 A number of other presentations included the global parish church map on which they hope to offer a site and information for every Ukrainian Catholic Church around the world. The site is already up and running, but needs to be filled with information. A bus took the coordinators to the Holy Resurrection Cathedral in Kyiv. A massive church structure with a large ‘patriarchal centre’ adjacent to it. 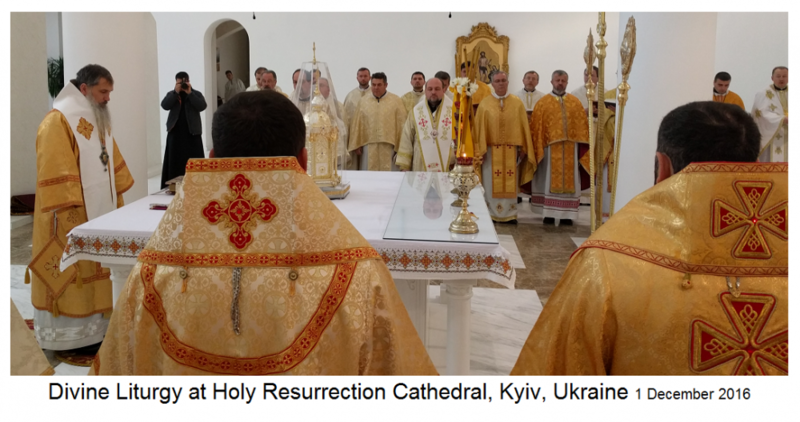 A beautiful Divine Liturgy was celebrated there with the Rector of the Kyiv Seminary, Fr. Peter Zhuk, preaching. A hot catered meal was provided in the large cavernous rooms below the church. Time was taken for an excursion of some of the Churches in Kyiv and then a mini-pilgrimage to the town of Vysh’horod the original site of the world famous miraculous icon of Our Lady of Vysh’horod – also known as Our Lady of Vladimir as that is the northern city to which the Icon was taken by Prince Andrei Bogoliubsky in the 12th Century. 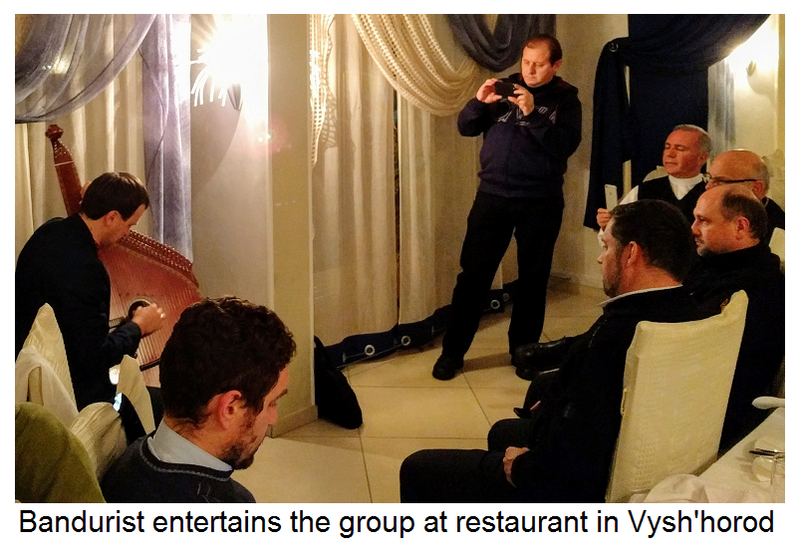 A supper was had at a local restaurant before we headed back to our hotel in Knyazhychi.